Penida can be visited on a day trip from Bali (same day return), but I think it’s better to spend at least a few days seeing things here. 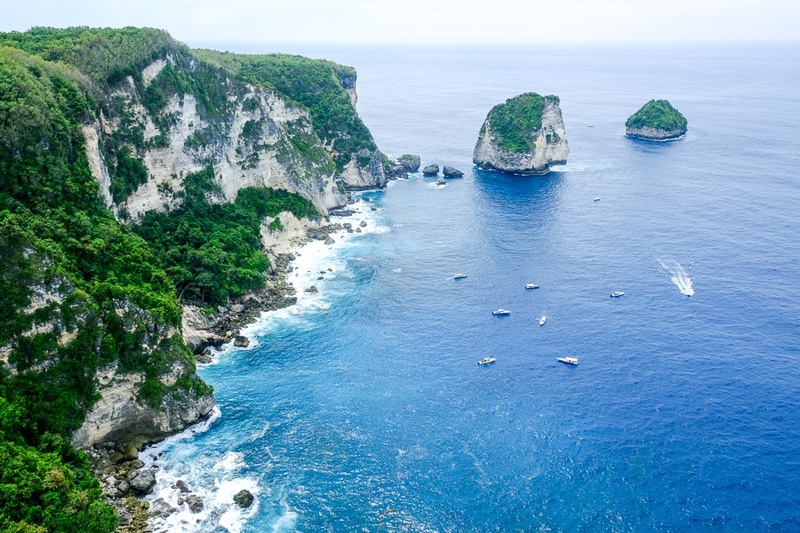 From Bali, the only way to reach Nusa Penida is by ferry or speedboat, with the speedboat journey taking about 45 minutes or so. 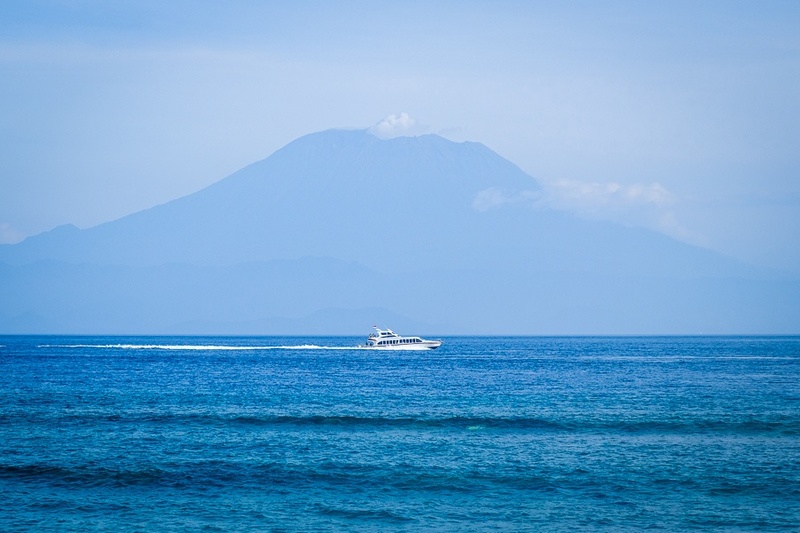 There are a bunch of speedboat companies making this trip daily, and they all depart from Sanur Beach in Bali at various times. 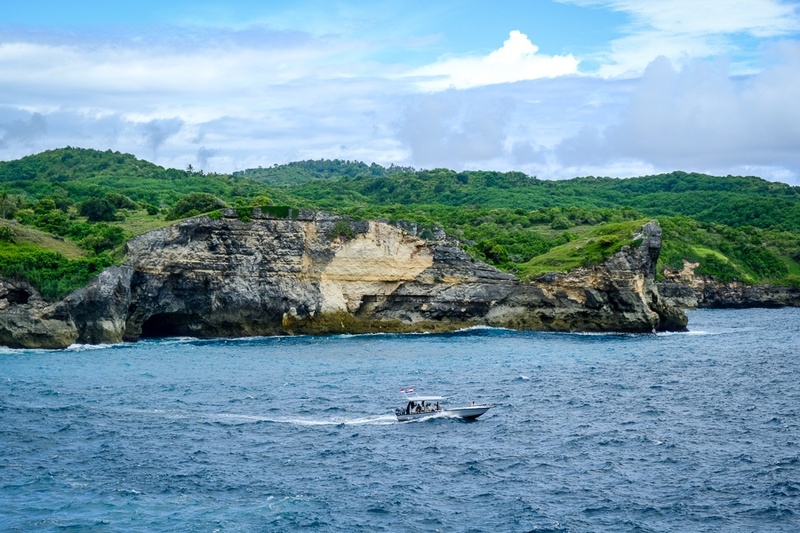 Here is my full writeup on how to get to Nusa Penida with one of these speedboat companies. 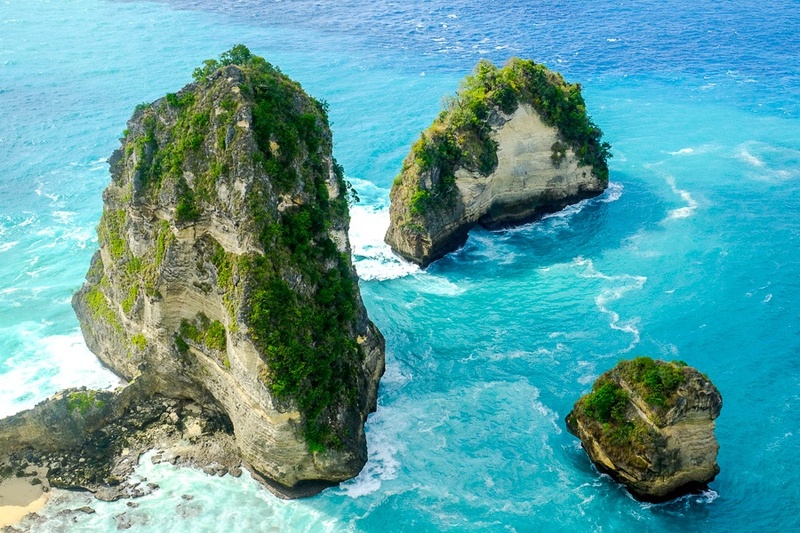 The other option is booking a day tour to Nusa Penida. 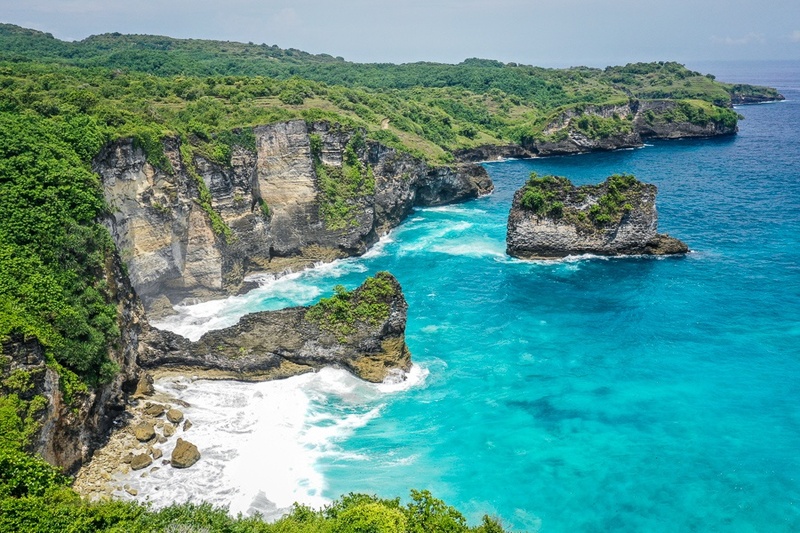 If you’re on a tight schedule or you’d rather skip the extra steps involved in arranging your own trip to Penida, here are some companies that offer prearranged day trips to Penida for as low as $50 USD, complete with hotel transfer, island tour, lunch, and same day return to Bali. 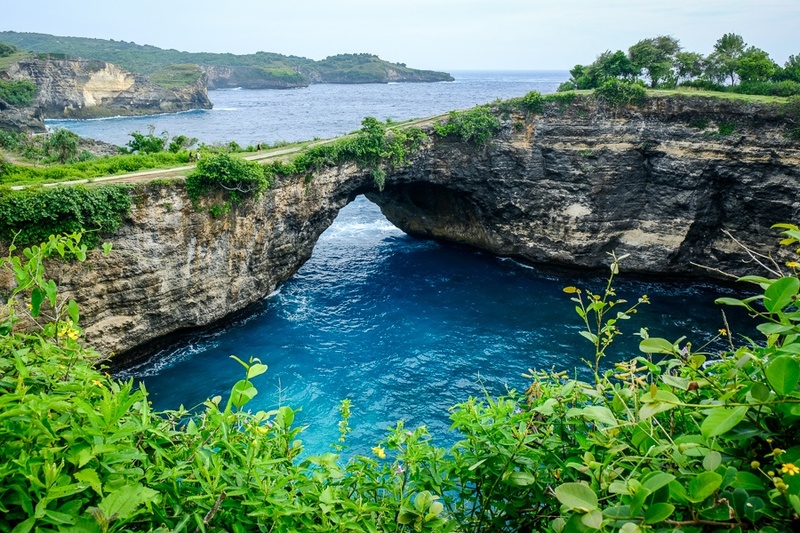 Nusa Penida can be visited on a day trip from Bali or Nusa Lembongan. 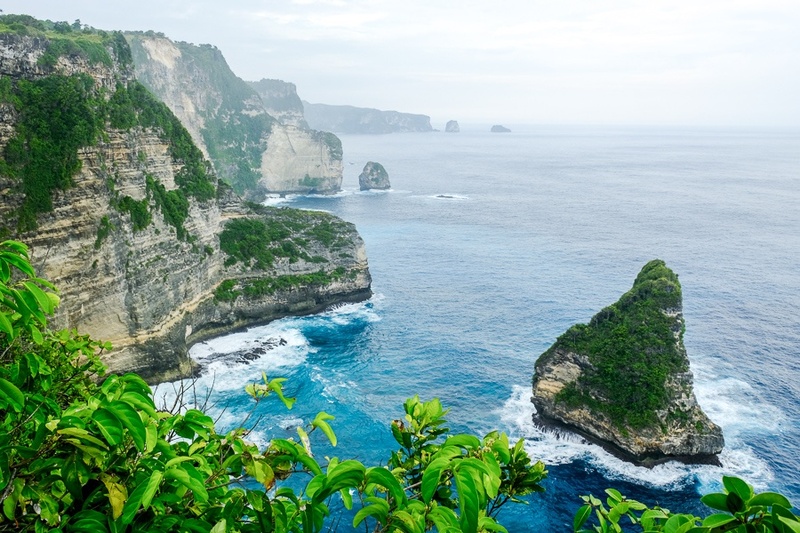 Just like in Bali, you have 3 main transport options for exploring Nusa Penida: motorbike rental, car rental, or car with driver. I’ve always done the car with driver, and the prices are roughly equivalent to what you would pay in Bali – 600,000 IDR ($40 USD) or less – for a full day of driving. I personally would never ride a motorbike on the broken, winding roads in Nusa Penida, but some bloggers might argue with me on that one. The choice is yours, just watch out for potholes and give your horn a good beep before turning any corners! Lots of people do travel Nusa Penida by scooter, so it can’t be too terrible. For most visitors to Penida, one of the first stops will be Broken Bay. This is a cool circular cove formed in the rocks, complete with a leftover arch. This area is also one of the popular hangout spots for the manta rays, so you’ll most likely get to see some rays floating around in the sea nearby. This is a cool tide pool located near Broken Bay. You can wade in the pool, or the ocean views here are nice too. 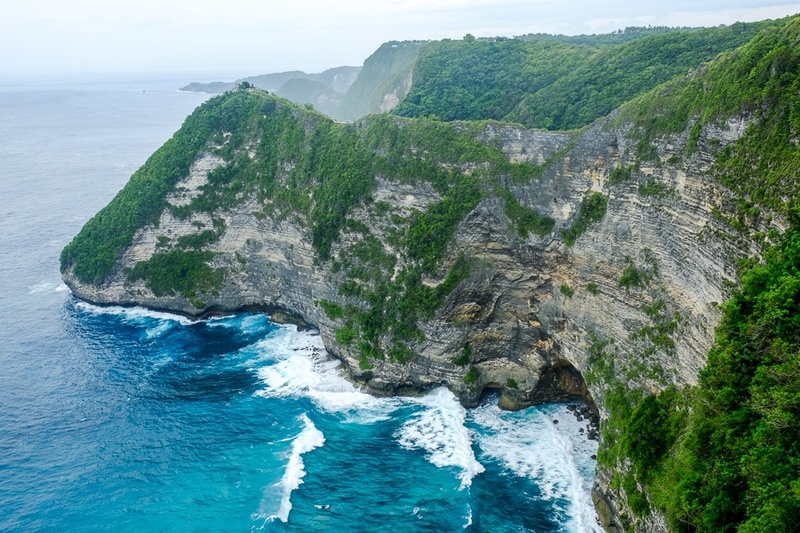 The Kelingking cliff is the most famous view in Nusa Penida, and probably one of the most famous views in all of Bali. This is an incredible “T-Rex jaw” shaped rock sticking out over the ocean, with perfect turquoise water splashing around it. The first time you look over the edge of the cliff and see this view, it really is breathtaking! The T-Rex shaped Kelingking cliffs. After you’re done staring in awe at the Kelingking T-Rex, the good news is that there’s also a path to go down to the beach at the bottom. This hike is a major workout, a bit scary, and takes at least 2 hours roundtrip. Bring water! Paluang cliff gives another viewpoint. Also known as the ‘car temple’, this is a weird shrine located on the west coast of Penida. 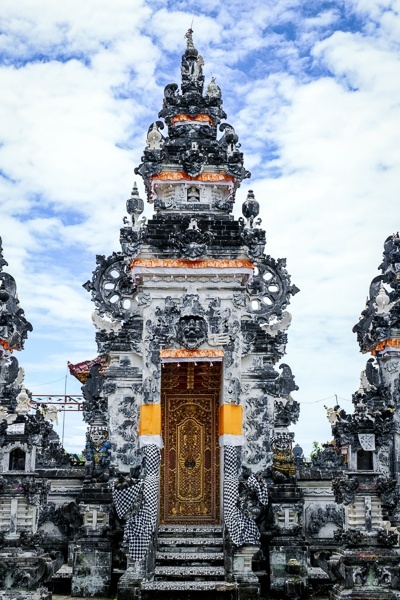 The temple is not far from some of the popular tourist sites like Kelingking Beach, so it’s easy to visit if you happen to be exploring that area. This is a little white sand beach with some cool cliff viewpoints. A lot of blogs get this place confused with Diamond Beach, but it’s actually a different place on the opposite side of the island. One of the popular spots on the west side of Penida is Crystal Bay. This is a good hangout or suntanning spot, and it has plenty of food and drink shacks for refreshments. Snorkeling gear can be rented here, or you can just sit around and chill out while eating some chicken satay. The great thing about Crystal Bay is that it’s one of the best spots to catch the sunset in Penida. Last July, I went back here with a buddy and we sipped Bintangs with our toes in the sand while the sunset came down over the rocks on the coast. 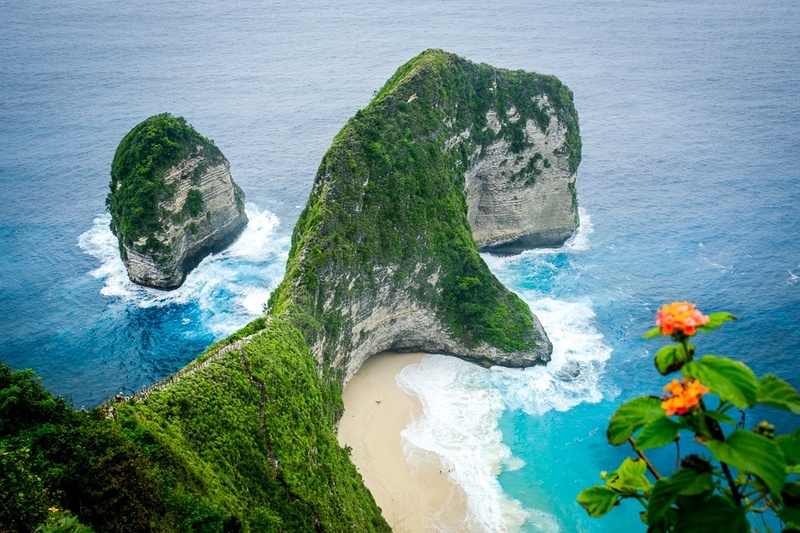 Crystal Bay is a popular sunset spot in Nusa Penida. Just a 20-30 minute walk over the hill from Crystal Bay is a second beach with less people. There’s a small drink shack at Pandan, but aside from that, the beach is all yours! If you really want seclusion, keep walking from Pandan and there’s a third beach over the next hill. This one has perfect white sand and no people! The great thing about Banah Cliff Point is that it actually has half a dozen different view points along the cliffs, and at each view point you can walk right up to the edge of the cliff and look down at the waves crashing on the rocks. 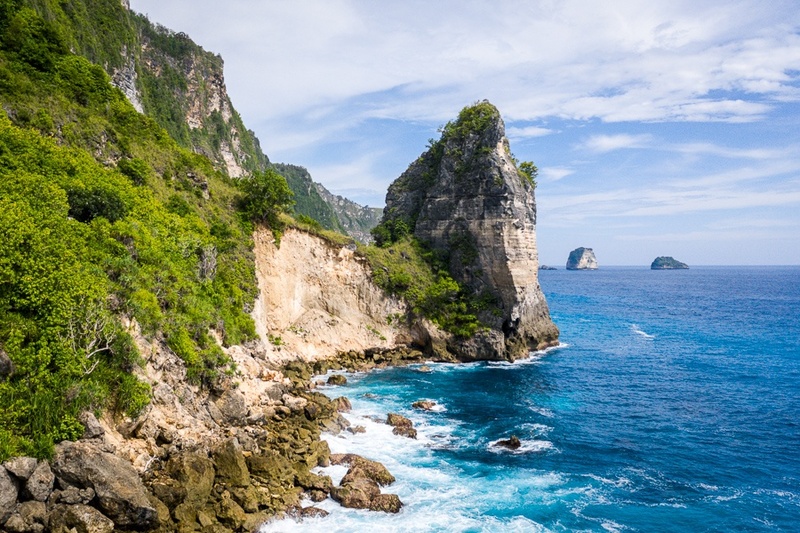 From these cliffs you can usually see a bunch of tiny manta rays and speedboats floating around on the ocean below. You can also see the Banah rock, a doughnut shaped rock sticking out of the ocean. Great stuff! Banah Cliff has multiple viewpoints. Pererenan point gives you a great view of some more sea cliffs, with tons of tiny manta rays swimming around in the ocean below. There’s a rickety bamboo platform here that you can climb onto for even better views of the cliffs. If you go left from the parking area, there’s a short, steep path to hike down to Seganing Falls. There’s a Hindu temple out there on the point, but access isn’t allowed. 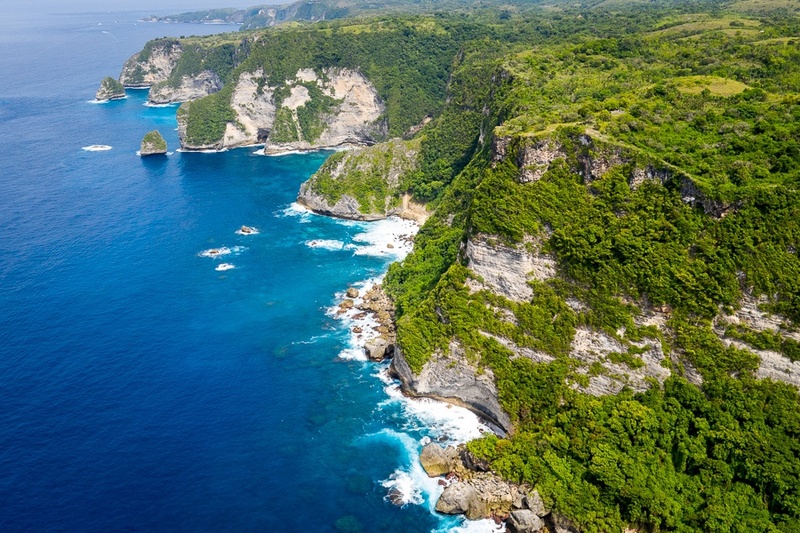 Indonesia is one of the best countries in the world for swimming with manta rays, and the west coast of Nusa Penida has a lot of great spots for doing this. The best known spot is Manta Bay. This is included on most snorkeling tours in Penida, which can run as low as 200,000 IDR ($14 USD) for a full day of snorkeling on a shared tour (here is the company I went with). If you have some extra time for a snorkeling tour in Penida, this is an epic experience! The manta rays may seem intimidating, but they don’t have stingers and they are not dangerous at all. Go for it! The manta rays are gentle and not at all dangerous to interact with. This is a group of underwater Buddhist statues located near the north end of Nusa Ceningan and Nusa Lembongan, but it can be reached by boat easily from Penida as well. 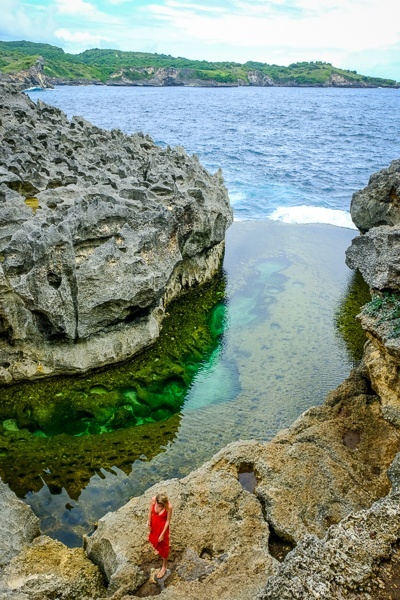 It’s a cool spot that can be added to any snorkeling day trip from Penida. There’s a 2.5 meter tall Buddha statue surrounded by some big bell-shaped stupas, similar to the ones at Borobudur Temple in central Java. This is another temple, but it’s located on land. Actually, it’s a cave! Goa Giri Putri is a Hindu cave temple located halfway up a mountain, on the east side of Penida. After crawling through a tiny hole in the side of the mountain, the inside opens up to a huge cave about 300 meters long, with high rock ceilings. Goa Giri temple is in a huge cave. While we’re talking about caves, there’s another one on the southwestern end of Nusa Penida called Tembeling Cave (sometimes spelled ‘Temeling’). This is an awesome sea cave that opens up to a view of the huge cliffs on the Penida coast. There’s also a small natural pool near the cave that you can take a dip in. The hike down to the cave and back takes at least an hour and it’s pretty exhausting, so be sure to bring water! Very cool place, and it’s right at the top of my “places to revisit in Penida” list. 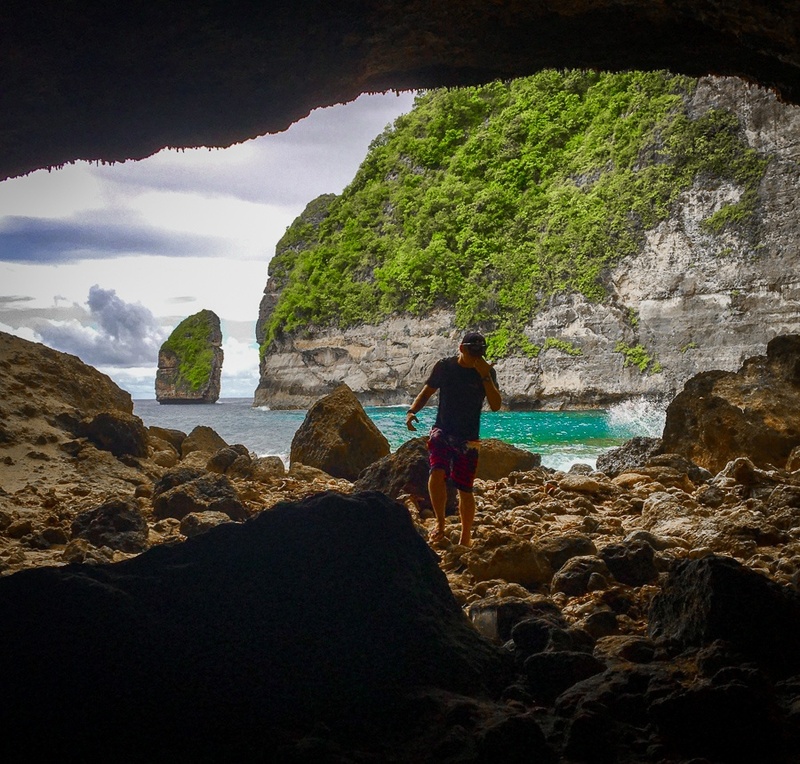 Tembeling sea cave has some incredible views of the cliffs. The view from the rocky Tembeling beach. If you like sketchy, remote hikes with steep paths to get your adrenaline going, this one is for you. Peguyangan is a tiny waterfall (more like a trickling stream) at the bottom of some cliffs, and you reach it by climbing down hundreds of steps on a rickety old wooden stairway. The ocean and cliff views here are incredible. 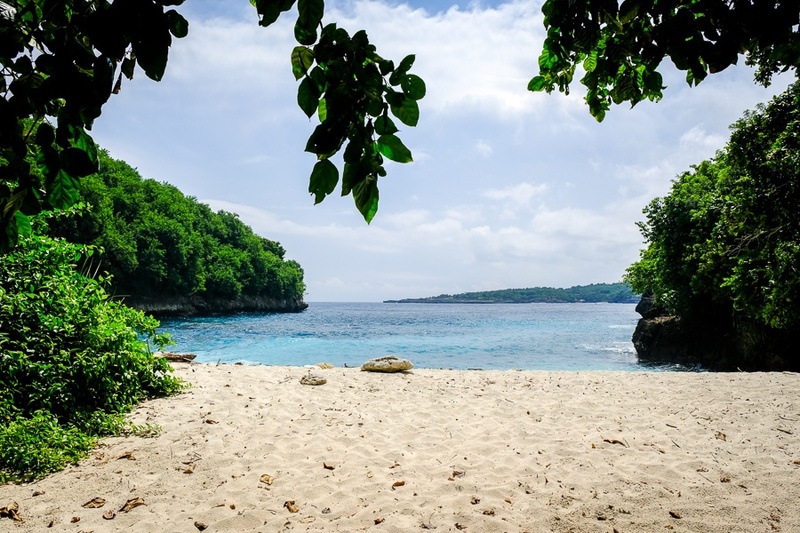 Are you looking for a hidden beach with perfect white sand and turquoise waves? Suwehan is one of the best hidden beaches in Penida. The hike down takes about 30 minutes and it’s exhausting, but totally worthwhile. This is one of my favorite places in Penida. There’s even a cool pointy rock that looks like a Christmas tree. This is one of the coolest beaches on the south end of Penida island. Unlike Suwehan Beach, Atuh is not a secret and there are sunbeds, beanbags, and a couple of nice food & drink shacks here. The highlight of Atuh Beach is probably the big elephant shaped rock in the ocean (locals say it looks like a stiletto), and the huge variety of sea life that can be seen trapped in the rocks at low tide. The locals say the rock at Atuh Beach looks like a high heel shoe. Raja Lima (Five Kings) viewpoint is named for the 5 big islands scattered across the ocean below. Three of the ‘kings’ can be seen in the picture below. 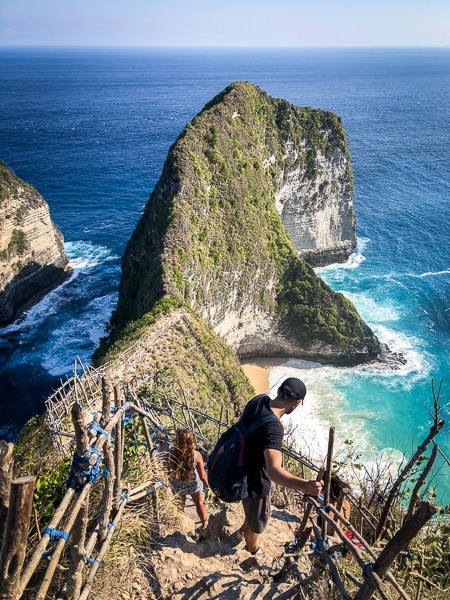 This is an awesome spot on the southeastern coast of Penida, and from this viewpoint you can also walk down some stairs and look at Rumah Pohon, which is the next item on this list. Three ‘kings’ at Raja Lima. Visiting this tree house, and then coming back later and staying a night in it, was probably one of the coolest things I have ever done in my travels. The room and bed are basic yes, but the views and location are out of this world. You’ll fall asleep to the sound of geckos chirping in the trees, and wake up to an incredible sunrise over the Raja Lima islands, with dolphins and manta rays swimming and jumping in the distance. You can stay the night in this tree house. Thatch view from the tree house. This is another awesome viewpoint that can be reached with a flat 10 minute walk from the main parking lots for Raja Lima or Atuh Beach. From here, you can look down at Diamond Beach and you can also see the little Rumah Pohon tree house in the distance. If you walk out to the point, there’s even an epic Balinese style bungalow you can rent and stay in for the night. I came here in the morning and saw a group of 15-20 dolphins jumping around in the ocean below. The stairway at the main viewpoint leads down to Diamond Beach, and the stairway at the far end of the point leads down to Atuh Beach. From this view point you can almost see the tree house in the distance. 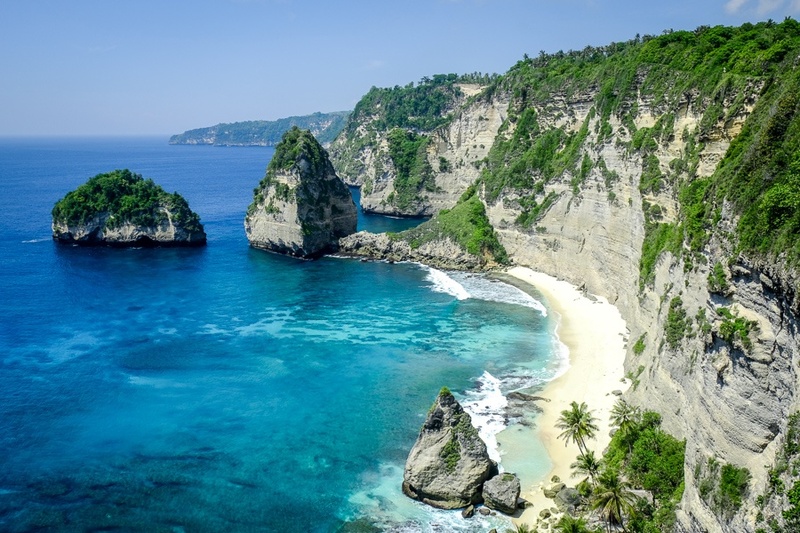 Diamond Beach, named after the pointy diamond shaped rock on the beach, is another utterly incredible “cliff beach” on the southeastern coast of Nusa Penida. It looks similar to Suwehan Beach, but even better. It’s newly accessible for the first time since late 2018, when a path down to the beach was carved into the side of the cliffs. Diamond beach gets its name from this unique pointy rock. The center of Penida island has these big round hills named after the background scenery from the Teletubbies kids show. If you come here during or just after the rainy season, the hills are a perfect green color. Manta Point is one of the most popular snorkeling spots in Penida, but it’s also the name of a cliff point overlooking the same location. You can sit here and watch the boats (and manta rays) come and go, with epic panoramic views all around you. Batu Siha is one of the most remote beaches on the whole island. This one requires a 4 hour round trip hike through some dense brush and steep cliffs, but the payoff is getting to see a beach that almost no one outside of Penida has ever set foot on! This is a less known cliff point on the west coast of Penida. The panoramic views here are great, but be warned that the road to Saren Cliff Point is one of the worst roads in the entire island! 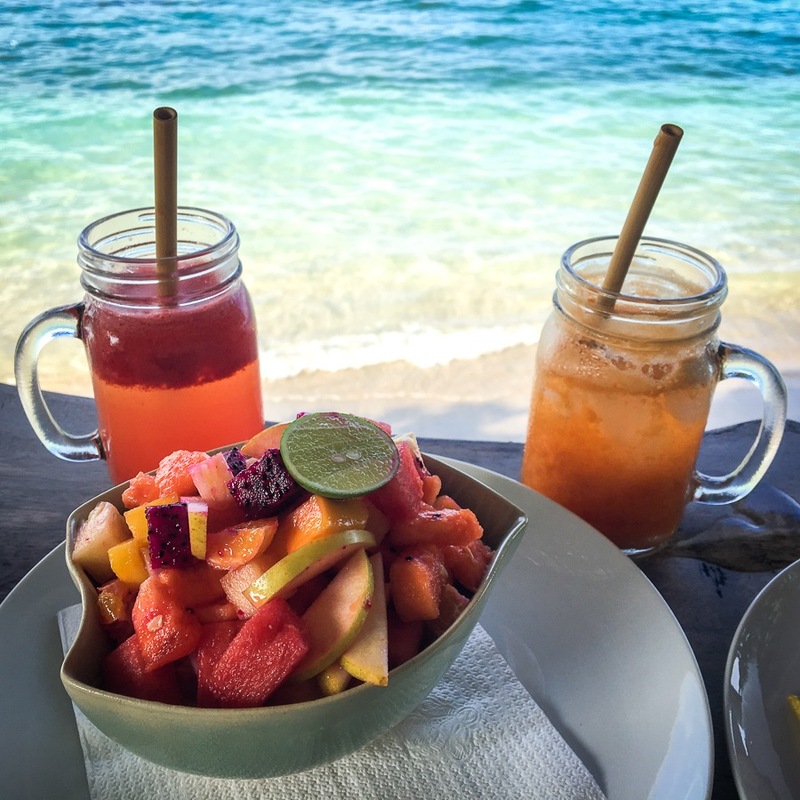 The north shore of Penida is lined with neat restaurants and beach bars where you can enjoy some tropical eats along with a view of Bali’s Mount Agung volcano in the distance. This is a great way to do breakfast on Penida island! Two cafe recommendations would be Penida Colada and Next Level Cafe. Hopefully this list was helpful! I plan to add more to it soon. Penida has so many things to see and do. It’s one of my favorite islands in Indonesia and I can’t wait to go back. You can find more information in the links listed below.